The pair might just be halfway done with its retracement as price tests the 38.2% Fibonacci retracement level. This coincides with the mid-channel area of interest, though, and might be a good spot to start scaling in. Ideally, I’m hoping to catch a bounce off the very bottom of the channel closer to the 61.8% level and the 1.7850 minor psychological mark. However, stochastic is already indicating oversold conditions or exhaustion among sellers, so buyers could take this as a sign to jump in. 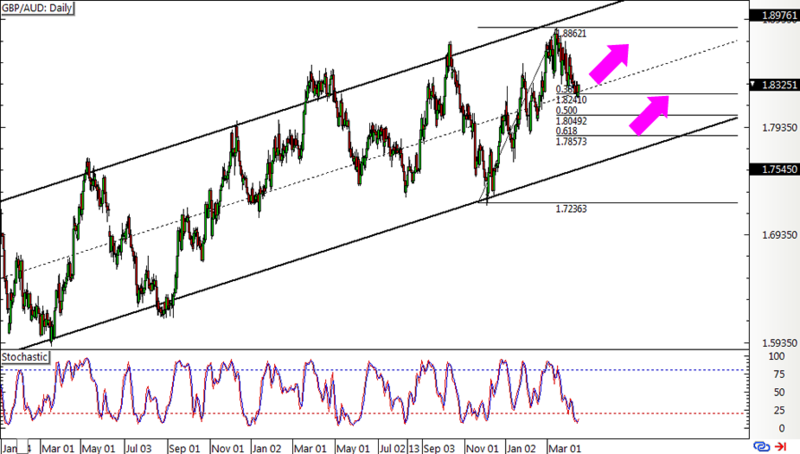 If so, GBP/AUD could recover to the swing high or the top of the channel closer to the 1.9000 major psychological mark. I’m bullish on this pair mostly due to recent Brexit developments, which involved the EU granting yet another extension for U.K. lawmakers to agree on a transition deal. This could ease the uncertainty weighing on sterling for the next few months, especially after parliament voted against a “no deal” scenario. Meanwhile, the Aussie appears under pressure after the freshly-released RBA minutes revealed that policymakers are also open to the idea of cutting rates if inflation keeps sliding. RBA officials also hinted that employment data should provide more guidance on their policy bias. I’ll be keeping close tabs on Australia’s upcoming jobs numbers to help me decide if I should wait for a deeper retracement or try to hop in, even with a smaller position, on a bounce off current levels. China’s GDP data should also bring in additional volatility before that. After all, the RBA did express some concerns about trade tensions weighing on commodity demand and export growth. Weaker than expected results could further dampen their outlook and fuel rate cut expectations. On the flip side, data from the U.K. has actually been coming in mostly upbeat in the past months, reflecting how the economy has been keeping calm and carrying on. In fact, the BOE has hinted that they’re open to “some modest tightening,” so the Brexit extension might give them some leeway to keep that hiking bias in play. For now, I’ve got my eyes on the 1.8200 support and the 1.7850 level for potential entries, setting my sights on the channel top as my target. What do you guys think?